When L&Q’s survey revealed that 81% of participants feel concerned, worried or stressed at the prospect of saving for a deposit, it was clear that many feel home ownership remains out of reach. Here to save these stressed out renters, L&Q’s latest PricedIn campaign demonstrates that aspiring homeowners can be ‘priced-in’ to the property market through Shared Ownership – an alternative route to home ownership which allows buyers to part buy, part rent. An evolution of the award-winning ‘This Is Sally’ and ‘Sally’s Next Step’ campaign, the new lifestyle film depicts the realities of those ‘just moved in’ moments through a series of four short films and one headline film. The ‘Your Home, Your Way’ campaign explores different scenarios that individual first time buyers experience whilst settling into their new home, with a light-hearted main film supported by a series of vignettes: ignoring the piles of boxes and enjoying your first cosy night in, throwing a makeshift dinner party for your new neighbours, letting that topiary passion flourish and finally, due for release in November, putting up your first Christmas Tree. Olivia Moss, L&Q’s Strategic Marketing Director comments, “Following our merger with East Thames, we have taken a broader approach to producing PricedIn content. As our Shared Ownership development programme expands across the country, our focus has widened from primarily Londoners, to our new audience of potential first time buyers in the Home Counties and further afield. Experts in creating authentic content, the new commercial is produced by the award-winning video content agency Shoot Media. 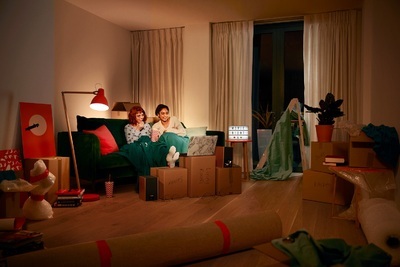 The first micro-campaign, PricedIn Living shows two friends enjoying their first ‘Cosy Night In’, propping up their laptop on unpacked boxes and settling down with a film and a bowl of popcorn.